The data-driven decision is another buzzword we hear more often nowadays. Some companies pretend they're doing it, some companies already understood it's not a panacea. Why? Numbers say what, they don't say why. Anybody could find some data to backup own opinion. It's easy to hide behind conflicting data and don't take a decision. 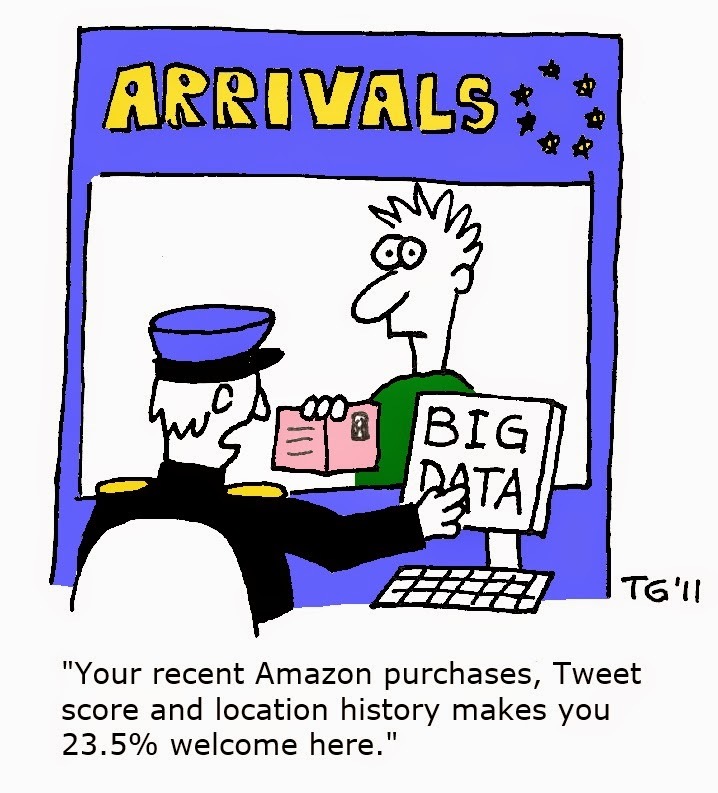 Nowadays companies are able to collect massive amounts of data about their users and customers. Every your step on their websites could be tracked, every link clicked, every form filled, every email read, every order placed, each complaint made. Well, you say, there is some massive knowledge they have. I would argue - it's just a massive amount of numbers they have. What do they do with them is the main question? And what should you do with yours ? Numbers: "100 visitors visited two blog posts you've written". Knowledge: "On the first post about cars visitors stayed 20 seconds on average, while on second about cats they stayed for 2,5 minutes on average." KPI (key performance indicators) is a known concept which effectively means : can we filter all our data for few really important for business indicators of our success? Two keywords here: filter and success - no "interesting", no "I'd like to know", no "we also have these". Nothing like this. Only the most important, only ones your company depends on. The likes of revenue, customer acquisition, new accounts per week, user retention, the number of paying customers...etc. Every company will have their own KPI, there is no "one-fit-all" approach here. Moreover, there could be company-wide KPIs and departmental KPIs. A general recommendation for KPIs, those should be: objective, trustworthy, believable, understood by every employee. To have a helicopter view of the data is always good. Though, to better understand your audience and their context you need to segment your data. User behavior on the desktop during the day might be very different to his behavior on a phone in the early morning. Presentation layer should adapt, but so should use cases and priorities. Described by Kerry Rodden in the following Google Ventures article. Happiness: user\customer satisfaction, perceived ease of use and net-promoter score. Engagement: return frequency, the number of visits per user per week or the number of actions taken per user per day. Adoption: the number of accounts created in the last x days or the percentage of users who use the specific feature. task), effectiveness (e.g. percent of tasks completed) and error rate. You can apply this model to a whole product or to a specific, big enough feature. The model could be customized to your needs and context. For example, if you design a feature to be used only once like migration tool - you most likely will not need retention metrics. To categorize knowledge using HEART you need to collect relevant for your product data. You should have those. A concentrated essence of what you want to achieve. Ideally, you set those up at the very beginning of a project, on a business plan phase. And no - "we want more money" is not a goal, it's a wish. The goal should be a bit more specific, moreover, it should contain a shadow of direction. "We want to increase revenue from subscription by 5%, improving existing customers retention" could be a valid goal statement. 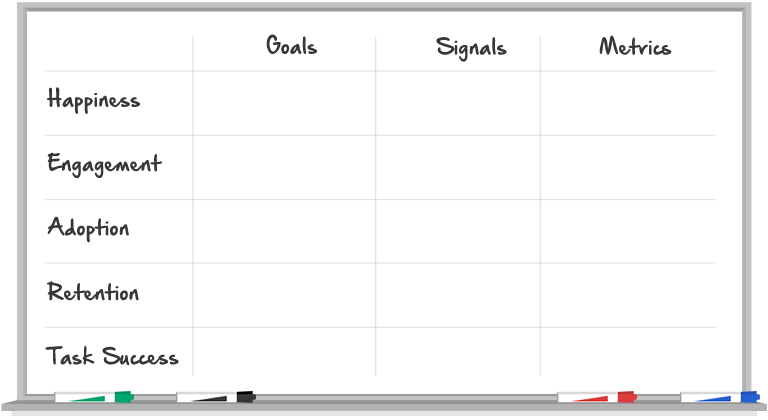 Knowing your goals you now can map them to lower-level signals. The question you should ask yourself is how success or failure in the goal will manifest itself in user behavior or attitudes? Following the example above when 10 of 1000 customers who log in to their account would switch to paid plan - it is a good signal, when more than 10 do not prolong their subscription it is a bad signal. Your metrics are the most granular view on a data. Those are specific to your infrastructure, to the tools and ways you track your product. "Number of existing customers who switched to a paid plan on a given day" is a good metric to contribute to a signal which will eventually lead us to reach our goal. This framework has been created for startups. It aims to simplify the measurements for these small companies in their journey to find repeatable and profitable business model. What is the highest volume channel (#)? What is the best performing channels (%)? What is the lowest cost channel ($)? Knowing those you'll be able to focus only on the most important ones. Focus your attention and your budget. The target of this stage is to guide a user to this one ultimate action you want him to do on your page. Be it post to read, registering for an account, buying a product, subscribing to a newsletter, browsing your catalog for at least 5 mins. You need to measure those key actions (preferably only one or a few). 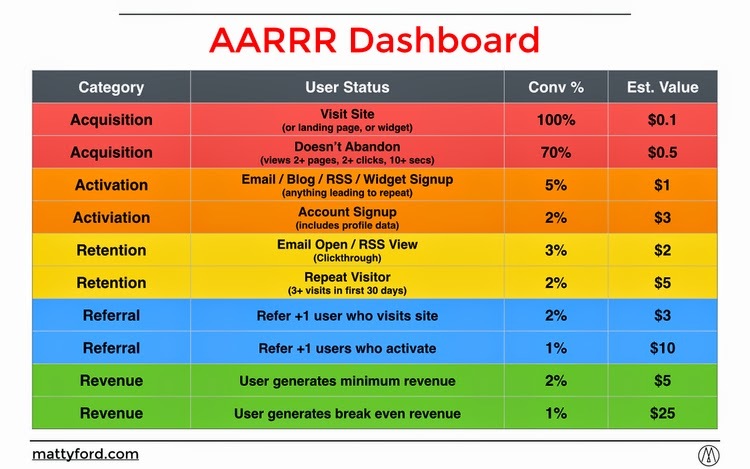 The target of this stage is to measure if and how your users\customers are coming back to you. Most businesses want customers to return, you need to measure if your customers are going back, in what cycles and what influence their retention. The target of this stage is to understand if your product good enough so that your customers are referencing it to their peers. "Shares", viral and "likes" all come in this category. Not all products should be viral, but we all want to hear our customers talking about our product as "great". The target of this stage is to ... well, guess. Do you earn money? Are you profitable? What is your added value? All money related questions and measurements go here. Competitive - benchmark yourself with your competitors.